I’ve moved my blog onto http://blog.adampaul.com – this change shouldn’t require any actions on your part, as the old URL will redirect to this one, and any RSS feeds should be automatically updated, but just in case you see any issues, this is probably why. I’ve also made my blog the landing page on http://www.adampaul.com, and in the coming weeks (months, years), will be working to integrate the content from my website and this blog. 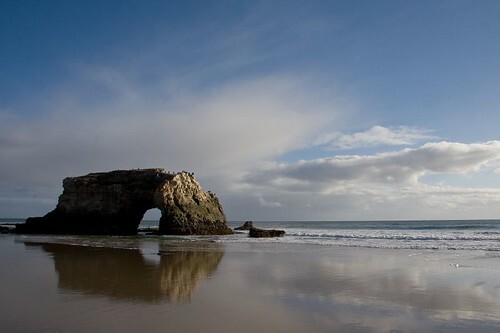 This should allow me to keep this blog more photography and nature focused, and I’ll no longer have to worry about the flow of interspersing restaurant reviews with travelogues and the like. Sorry it’s been so quiet here for the past week+. I managed to get a case of acute tendonitis in my right hand early last week, which required me to minimize typing and especially mousing, and then picked up a 48-hour flu’ish bug mid-week, uggh! I’m feeling much better now, though, and hope to resume the South American travelogue in a day or three, as well as get caught up on my blog friends’ writings. 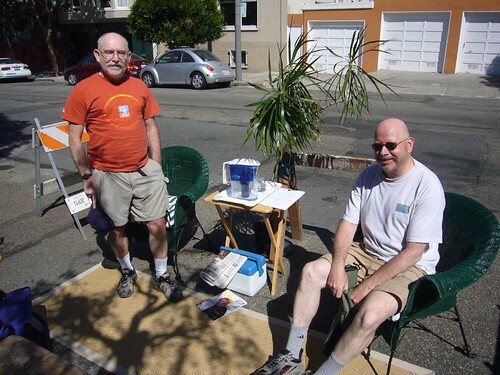 Friday was PARK(ing) day in San Francisco, where folks convert parking spaces into actual mini-parks. There were several dozen locations about town, and I decided to hop on my bicycle and visit the 7 nearest home. It didn’t start well, with the park at Fulton & Masonic gone missing (odd, since it was sponsored by the SF Bicycle Coalition & FixMasonic.org), and the one on Cole & Beulah consisting only of a couple of potted plants in the street, and a garage sale on the sidewalk. 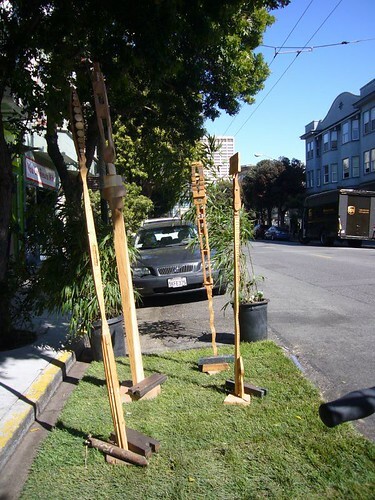 Down in the Lower Haight on Scott St., however, two gentlemen had a nice little park set up, with a sisal(?) rug, plastic chairs, water and lemonade. We chatted for a few, and I continued around Duboce Park and on to the park at Noe & Market. This was a fun park, with astroturf and a nice woman (Adriana?) giving hula hoop lessons. 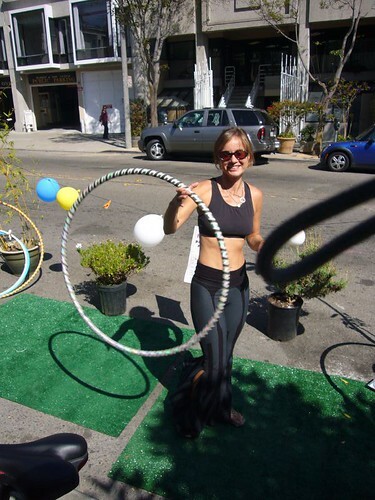 Lets just say that I’m not a born hula hooper…. A left on Market and a few blocks down the supposed park at Market and Church was also gone missing but shortly after that at Market and Duboce, was the best of the parks I saw, a full-fledged library (with WiFi!). I sat for a few and read some bicycling-related pamphlets and enjoyed sitting on turf as cars and trolleys rolled down Market St. Heading north now on Octavia I found the Hayes Valley park, smack in the middle of the business district. Although it was a nice park, featuring little totem poles made by a local artist, the people running it were too busy talking to each other, and paid their guests little/no attention. 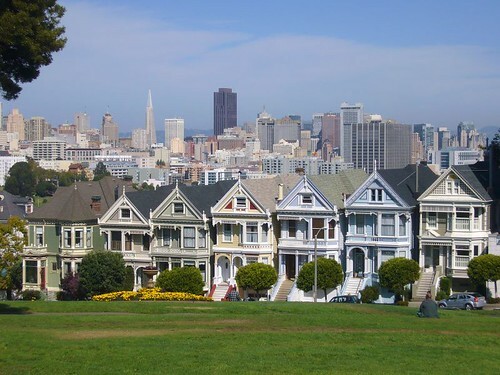 I found myself wishing I’d printed out a bigger list of the parks, since many were downtown and it was a short ride away, but I didn’t, so I slogged up the Hayes St. hill, stopped for a moment at Alamo Square to admire the view, and rode home. 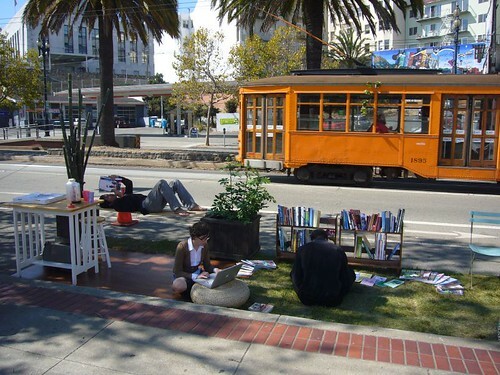 PARK(ing) Day is a fantastic idea, and I’m glad it’s catching on in other cities. Next year I will be more organized and try to visit as many as possible.